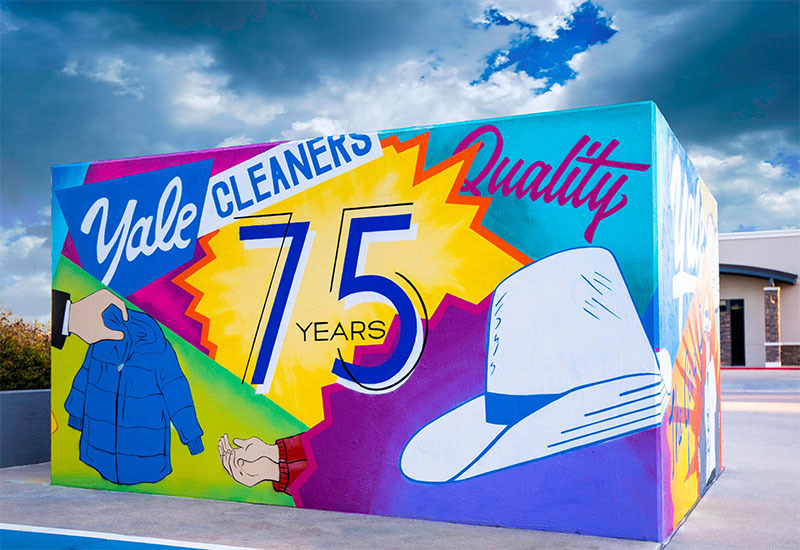 What an amazing accomplishment, this year Yale Cleaners is celebrating our 75th anniversary in business. From our humble beginnings of a single store on Route 66, to currently twelve locations serving Tulsa, Owasso, Broken Arrow, and Sapulpa. As our city has grown, so have we. My family and I are so blessed and thankful for the support of this amazing community. To kick off our year of celebration, I have commissioned a mural to commemorate our company's rich Tulsa history. Local artist, Scott Taylor and his company Color Pop have been hard at work making this dream become a reality. 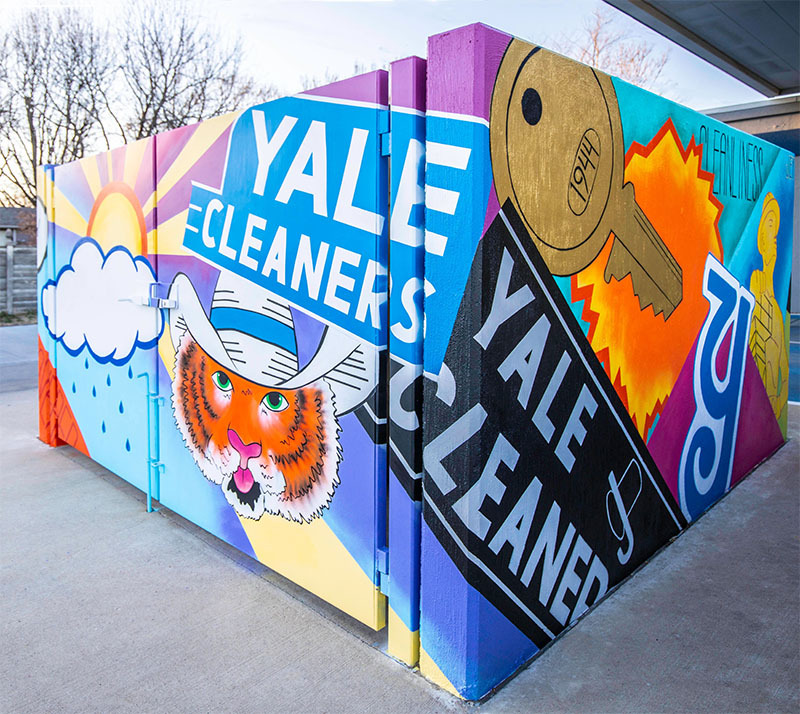 After several discussions with Scott, he developed a unique 4-sided mural that captures the many unique aspects of Yale Cleaners' service to the community. This one of a kind work-of-art needed a very special home. So, it was only fitting that we selected to paint it by our Car Hop at our Brookside location. Our Brookside location, better known as Yale Cleaners #9, holds a place of distinction within our company. While it is definitely not our newest store, its design and installation in 1990 was the key to Yale's success. While it's hard to tell from the outside of the building, Store #9 was the model for our very first store built from the ground up, just two short years later. The way our buildings look today with the covered Car Hops, and the way the clothes flow through the buildings is all do to the success we found in the design of Store #9. The first thing you notice when looking at the mural is its vibrant, bright colors. Just like our company, this mural is full of energy and life. Each side tells a little piece of our company's story. On the east side, the first thing to catch your eye is the big gold key and the word "cleanliness". Inscribed on the key is 1944, the year of our founding. Back in those days, the Yale Lock was synonymous with a quality and a trustworthy company. Those were the very principles our founders wanted Yale Cleaners to be built upon. Our first facility was located on 11th and Yale. So, it was decided, our new company would be named Yale Cleaners with the slogan "the key to cleanliness". 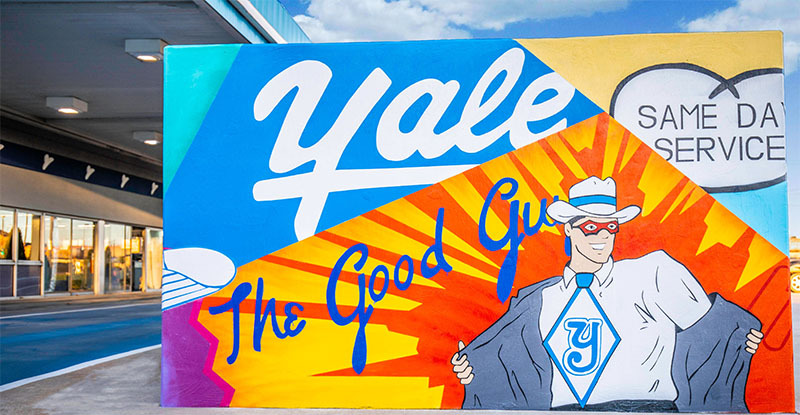 The east side also features a Yale Cleaners logo from the 1950's and our current "Y" that we are all familiar with today. You will proudly see Tulsa's Golden Driller, which represents the city that we love and serve each and every day. Lastly, if you look close, you will see the initials JEY in the upper right corner. For the past 20 years, our store manager Joan Yates has been a mainstay in the neighborhood. We found it only fitting to include her into this work of art. Moving on to the south side of the mural you will quickly notice a tiger wearing our iconic White Hat. This might seem odd to include, but this tiger has a story to tell. You see, up until 1984, it was illegal in the State of Oklahoma to promote dry cleaning, advertise price or even offer coupons. So, for two years, my grandpa Jim and 2 other dry cleaners lobbied the legislature to resend the Cleaners, Dyers, and Pressers Act of 1938. They finally prevailed, and Yale Cleaners offered the very first coupon for dry cleaning in our state! From the very beginning, our company decided to incorporate art into our coupons. This tiger was featured in our coupons for many years in the late 80's and early 90's. The south side also features an amazing sunrise, a rain cloud and the word "Covered". Each day, no matter what adversities we face, our team is dedicated to serve customers and always deliver on our promises. One of the ways this can be seen is through our popular covered Car Hop service. In addition, our logo and sign from our original location in 1944 is featured in the upper right corner. This anchors our company to the past and serves as a reminder to always live up to the values we were founded on. The west side of the mural represents how our company has evolved over the years. In the upper left corner, you will see our logo from the late 60's and early 70's. To the right, you notice the words "Same Day Service". Below, you boldly see "The Good Guys" with our superhero "Captain Savings". You see, throughout the 60's and 70's Yale began to lose direction. We had become a company with no focus. So, my Grandpa Jim decided to make a change. First, he convinced his son-in-law (my dad, Bill Rothrock) to quit his job and join the family business in 1979. Next, he reached out to a family friend to "rebrand" the company. Finally, my Grandpa Jim, Dad and Uncle Jerry set out to totally transform the business, and that they did! In 1979 Yale Cleaners rebranded to the "the guys in the white hat" and my dad Bill Rothrock became the face of the company. They had a new logo and brand, but they didn't stop there. They decided to focus the company on providing fast service, with great quality and at a reasonable price. So, throughout the 80's they built and rebuilt stores until they developed the systems and tools to meet their goals. In 1982, Yale Cleaners was the first dry cleaners in Oklahoma to offer Same Day Service (drop off by 9, ready by 5). Ultimately, we were able to expand that service promise to drop off by 12, ready by 5. Last, but not least "Captain Savings" is a character we created in 2000's that represents our commitment to customers to always provide our services at a fair and reasonable price. From time to time, you can still find Captain Savings included on a coupon in our App, Website or Facebook Page. The north side of the mural is probably my favorite. This side features our 75th anniversary logo (created by my sister Kathryn) and our iconic White Hat. But the image I am most proud of is the unknown person handing a child a coat. My family and Yale Cleaners have always believed in giving back to the community in meaningful ways. Our biggest charitable contribution to the Tulsa metro area is our Coats for Kids program. 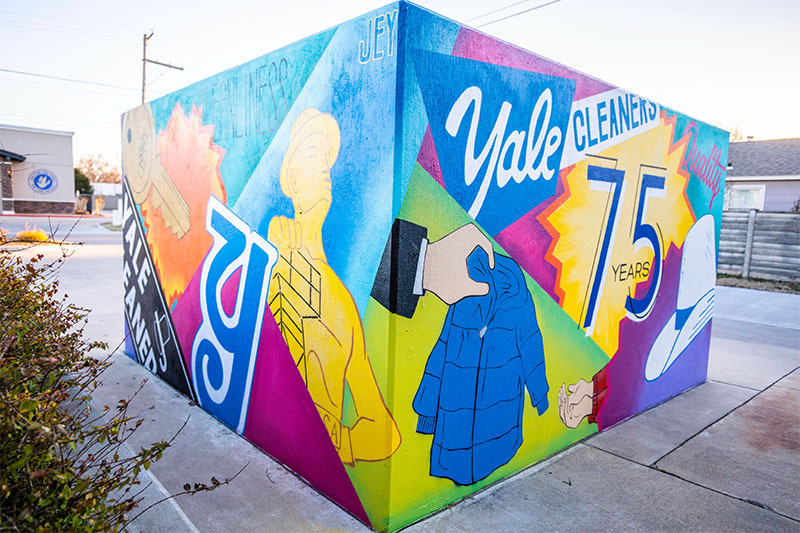 Over the past 75 years, Yale Cleaners has had the pleasure of serving Tulsa families. Our loyal customers have counted on us to consistently clean their everyday wear items. But more importantly, we have been there to clean their most cherished garments, the ones worn on the most important days of their lives. From christening gowns, to wedding dresses, first job interview suits, to barrel outfits, you know you can depend on Yale Cleaners. From my family and the entire Yale Cleaners crew, we appreciate you, our valued customers, and look forward to serving you for many more years to come! Yale Cleaners, "the guys in the white hat." 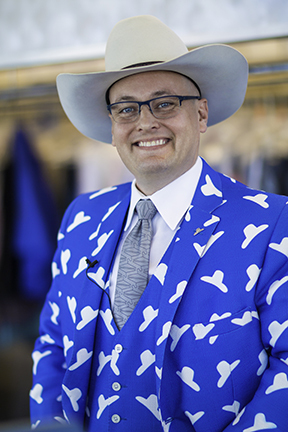 John Rothrock is the President and CEO of Yale Cleaners, a local family business focused on providing high quality, same day dry cleaning with exceptional customer service. He earned a degree in Business Administration in 2005 from The University of Oklahoma. John is a graduate of the Drycleaning and Laundry Institute and is a Certified Professional Drycleaner (CPD), Certified Professional Wetcleaner (CPW), and a Certified Environmental Drycleaner (CED). Having all three of these certifications makes him a Certified Garment Care Professional (CGCP), a distinction held by few people in the dry cleaning industry.